Want to encourage kids to eat healthy? Just invite them to the White House for lunch. See photos. WASHINGTON — Kathryn Duvall walked through a pair of tall double doors and past a sea of Secret Service agents onto the North Portico of the White House wearing a blue dress and a big smile. She’s right. But on Thursday, Duvall was one of 18 10-year-olds — and 38 8-, 9-, 11- and 12-year-olds — to join first lady Michelle Obama in the East Room of the White House for lunch. The event was the annual Kids’ “State Dinner,” and its 56 attendees were winners of this year’s Healthy Lunchtime Challenge, a contest where kids ages 8 to 12 submit healthy, affordable lunchtime recipes. On the menu was watermelon salad, sweet and savory chicken and peaches, cauliflower rice, zucchini paninis, fruit salad and a spinach smoothie — all winning recipes from the 1,200 received in this year’s contest. 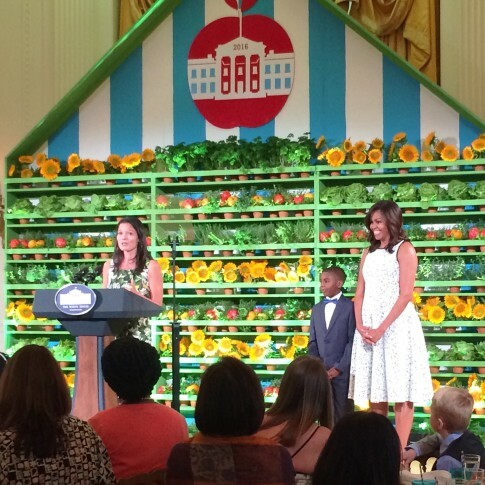 Special guests included Food Network star Rachael Ray and Samuel Davis, an outspoken 12-year-old from Louisiana and the 2015 winner of the Healthy Lunchtime Challenge, who has since become an ambassador-of-sorts for the first lady’s efforts in childhood nutrition. “When I was 3 years old, I learned that eating healthy was like throwing a party for your belly,” Davis told the crowd. All 50 states, five territories and the District of Columbia were represented at the lunch, which was made using fresh vegetables and herbs from the first lady’s White House Kitchen Garden. Duvall’s winning recipe, called Victory at Yorktown, was a wrap with hummus, chicken, avocado, carrots, tomatoes and cucumbers. Colby Trenor, a 9-year-old from Maryland, showcased local blue crab in his winning recipe for Maryland crab lettuce cups, and 8-year-old Elena Sotobashi of D.C. won the first lady and her panel of expert judges over with a recipe for DIY sushi rolls. Thursday’s Kids’ “State Dinner” was the first lady’s last before leaving office. Instead of turning out the lights after the event, Obama passed the baton to the next generation. “When it comes to building a healthier country, we’re counting on all of you guys to lead the way. So many of you have already stepped up in your families, your schools, your communities … I see the work of kids, the magic you all do,” she said.